Life is motion. On a physical level, to completely cease all motion is to die. Only at death are we motionless, or still. So what does it mean to “be still” when we are holding a posture, seated in meditation or even in deep sleep? We never truly render our bodies still nor should we for complete stillness equates to death of the body. Through the act of becoming still something shift. To reach a still state we must embrace slowing down. Like torpor experienced by hibernating animals, we begin to slow our bodies and minds down but not with the intention of turning away from the world. Coming toward stillness is coming into direct experience with the world around us. Stillness is often described by the well-loved metaphor of stilling ones mind as though a pond, free of ripples. Even though the top may appear perfectly still underneath life is swimming. But in the act of the winds ceasing to blow and the disturbances on the surface ceasing to occur we are able to see more clearly through the waters. In the act of stilling we are able to come into a closer experience with our true nature. In the experience of our energetic body, motion creates vibration. Sound is a result of vibration. Once the vibrations are stilled or slowed there is less sound. In the silence we are able to hear. We can understand sound as the information our ears receive but there is the physical sound or the vibrations our body receives as well as the vibratory information our eyes receive. In slowing ourselves toward stillness we are reducing the many forms of vibration within our experiences. As this form of all encompassing silence is reached we are able to experience the world around and within free from the disturbances of all the vibrations. In the experience of slowing down there is a subtle sensation of expanding. Coming toward a still state brings with it deep experience and alignment. To bring oneself into stillness is to bring one self into alignment with the movement of the natural world or what some call flow. To be still is to move in sync with the universe. Yoga Nidra is one of the most effective forms of meditation to create lasting change in your daily life. You will be guided in leading awareness through many levels of mental processes to a state of supreme stillness and insight. Within this state you create new patterns of thought and beliefs, which infuse your fail life with greater meaning and directed purpose. The practice of Yoga Nidra can energize your heart’s true desire. Through this series you will excavate a very personal and effective Sankalpa (intention.resolve) that will be the thread fo your experience for the 6-weeks. Each week you will receive a digital recoding of that weeks Nidra practice to keep and support you in your home practice. Your commitment will involve weekly journal assignments and the creation of a daily practice. 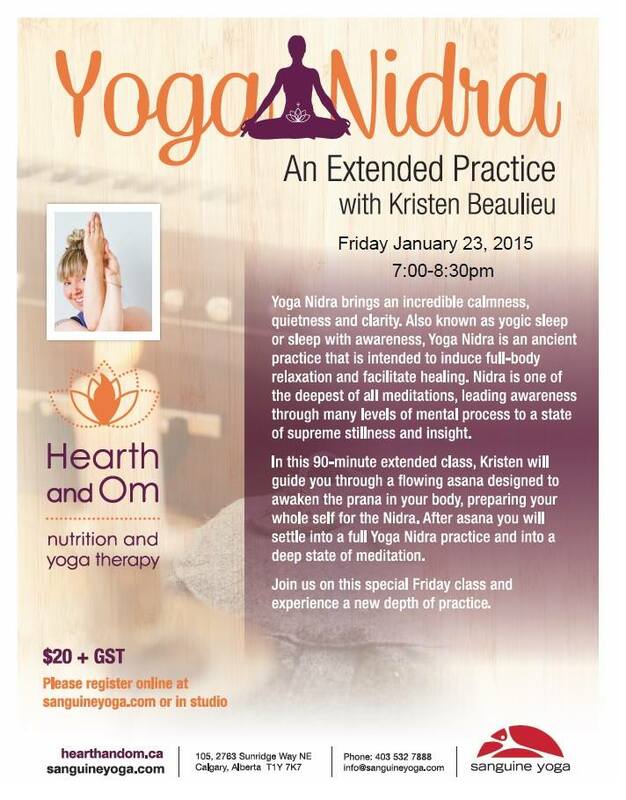 Experience the profound potential of Yoga Nidra to create true change in your world. Some previous experience with yoga is suggested. Please contact Sanguine Yoga Studio to hold you spot. http://www.sanguineyoga.com or by calling (403) 532-7888. 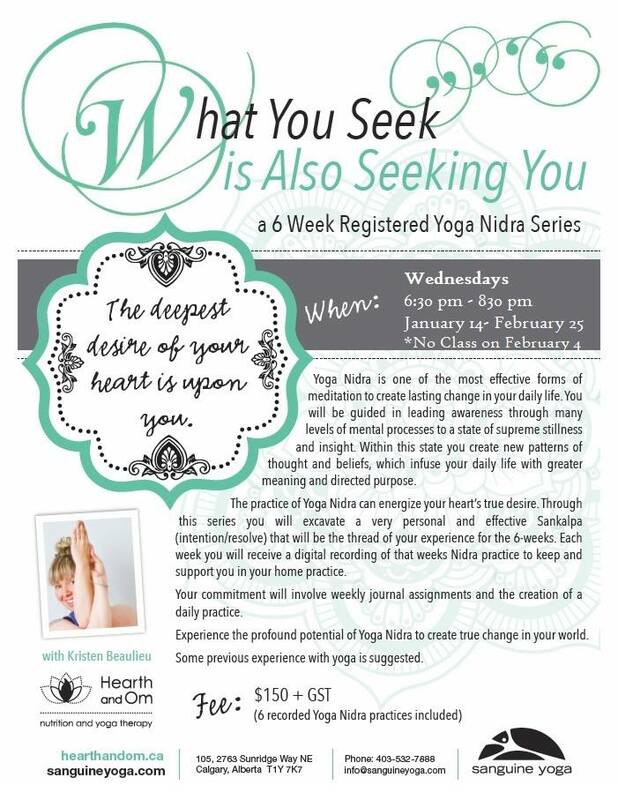 The program includes 6 recorded Yoga Nidra practices to support your home study. Yoga Nidra brings an incredible calmness, quietness and clarity. Also known as yogic sleep or sleep with awareness, Yoga Nidra is an ancient practice that is intended to induce fully-body relaxation and facilitate healing. Nidra is one of the deepest of all meditations, leading awareness through many levels of mental process to a state of supreme stillness and insight. In this 90-minute extended class, I will guide you through a flowing asana designed to awaken the prana in your body, preparing your whole self for the Nidra. After asana you will settle into a full Yoga Nidra practice and into a deep state of meditation. The first practice of the year will be held Friday, January 23 from 7:00 – 8:30 pm. Fee: $20 + GST will reserve your spot. 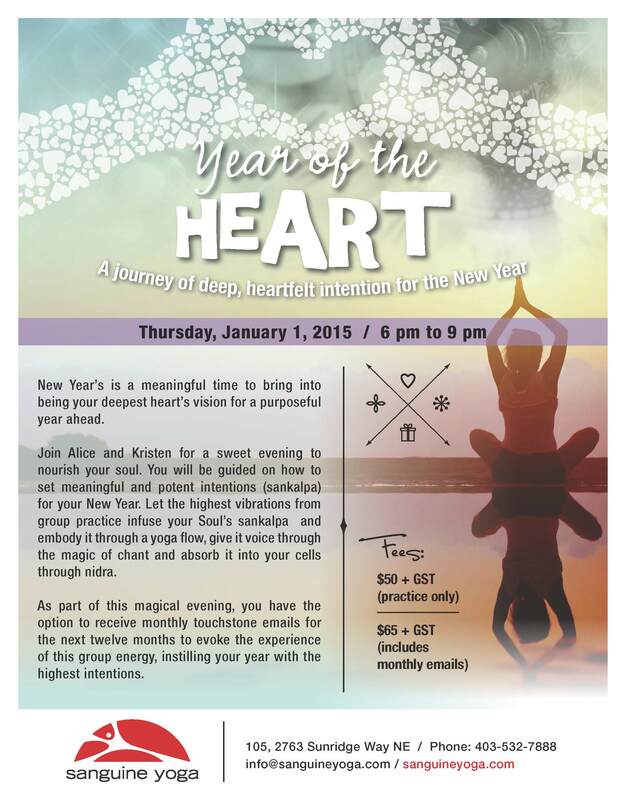 Bring in the New Year with this very special and nourishing “Year of the Heart” workshop brought to you by Alice Hong and Kristen Beaulieu.